Today the practice starts and it has been busy at the tunnel all day as teams take the opportunity to practice, and if they have not been to Voss before, get used to how this tunnel works; whilst the organisation is finalising everything and preparing for the opening ceremony this evening. They are expecting National TV here following up on a broadcast they made from Voss centered on the tunnel last Friday on a TV programme called 'Around Norway' and featuring the European Championships, the Tunnel, and Voss's celebrity Amalie Hegland Lauritzen. This can be found on a link to https://tv.nrk.no/serie/norge-rundt - it is in Norwegian but excellent coverage for our sport. 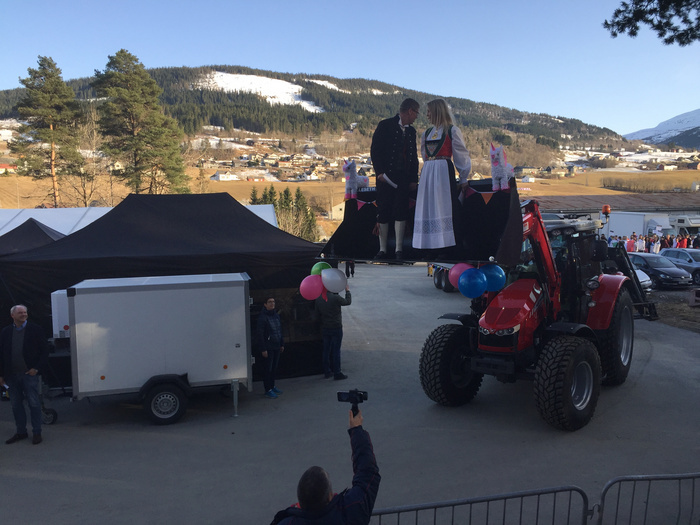 The opening will be hosted for the TV coverage by another local celebrity from the Norwegian 4-way team Jan Fredrik Karlsen and a Norwegian Olympic medal winner (gold, silve and bronze) sports star from Moguls Skiing (who is also a fler), and lives in Voss: Kari Traa. Each day from the competition the Commercial TV station that broadcasts "Goodmorning Norway" will be putting out a 10 minute programme (so that is 3 times) during the European Indoor Skydiving Championships it will be on mainstream Morning TV out of which the TV company will put together a News Item to be included on the main news on Saturday. The opening ceremony took place at 19.00 hrs outside the tunnel on a beautiful spring evening, with blue skies and the setting sun. The presenters entered the arena in the bucket on front of a tractor, followed by another tractor with trailer which provided the stage for the ceremony and the competitors following their country flag.